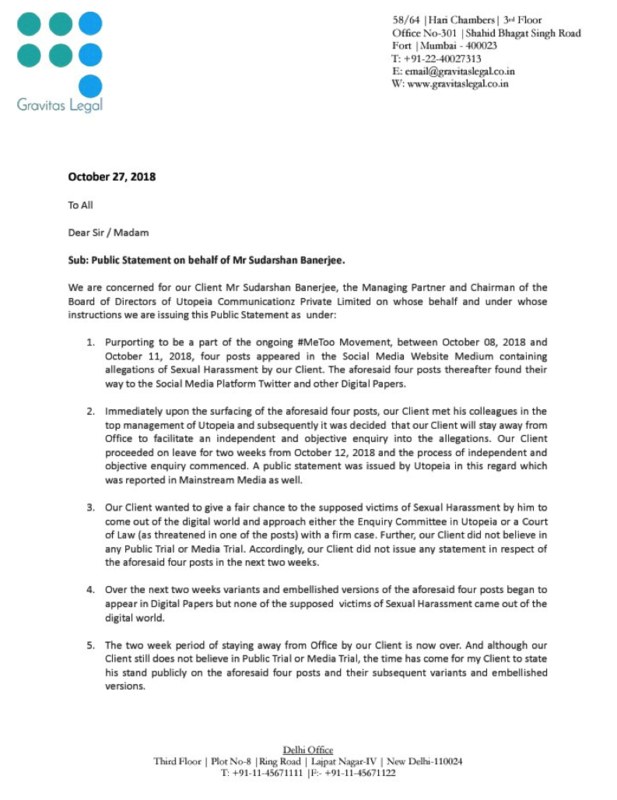 Sudarshan Banerjee, the co-founder and managing partner of Indian advertising agency Utopeia Communicationz, who has recently been named by several sources in sexual harassment claims via posts on the internet, as well as in accounts sent directly to Campaign Asia-Pacific, has shared a statement from his lawyers on Twitter. It states that three of the four accounts of harassment are "figments of imagination and utterly false and concocted". The other post is described as a "twisted and distorted and embellished version of an old and closed Human Resources (HR) issue involving an ex-employee of Utopeia." The letter states that Banerjee believes all four posts were shared as part of a "criminal conspiracy" to "tarnish the goodwill and reputation of [Banerjee] and Utopeia for ulterior gains". Banerjee has, according to the letter, initiated legal proceedings against the "conspirators". The four posts referred to were initially shared on the website Medium, the letter reads, and afterwards were shared on Twitter and "other Digital Papers". Campaign Asia-Pacific was contacted by authors of two of the Medium posts, who revealed their identities to us but requested to remain anonymous. They wanted to share their stories partly because the posts that they said they had written on Medium about Banerjee had been removed. We shared their stories, which included claims that Banerjee repeatedly made inappropriate comments to them or came very close to whisper to them or touch them, making them feel consistently uncomfortable in his presence. Campaign gave Utopeia ample time to respond, and included the company's responses in our article. Both these former employees mentioned that the position held by Banerjee's wife as head of HR made it hard for them to seek help. 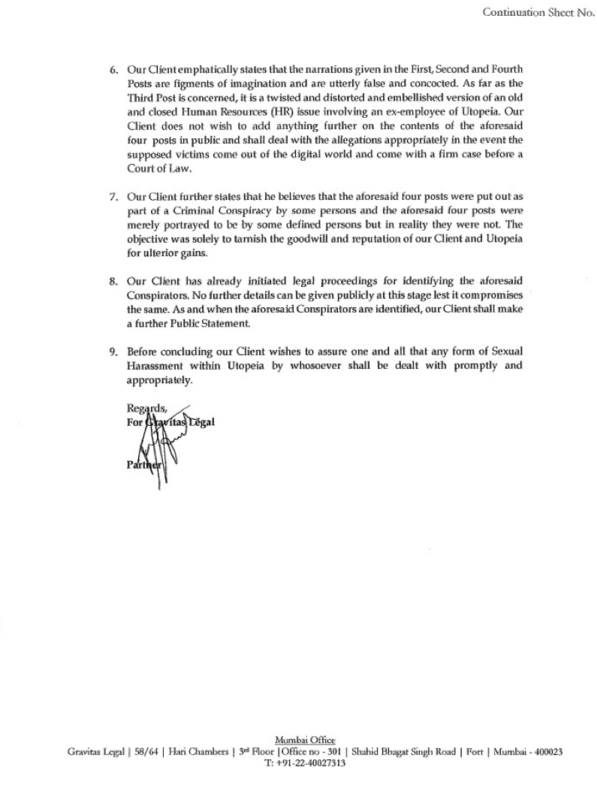 The letter from Gravitas Legal, shared overnight by Banerjee, says that as soon as the posts surfaced online, Utopeia's top management agreed that he should stay away from the office during an investigation. He was away for a two-week period from October 12. The letter states that Banerjee wanted "the supposed victims" to "come out of the digital world" and approach the enquiry committee at Utopeia or a court of law. According to the letter, none of them did. "The time has come for my client [Banerjee] to state his stand publically on the aforesaid four posts and their subsequent variants and embellished versions" the letter reads. Further to stating that the posts are "utterly false", Banerjee will reportedly not speak further about the claims in public and will "deal with the allegations appropriately in the event the supposed victims come out of the digital world and come with a firm case before Court of Law".